Global surgery - and inequitable access to surgery around the world - constitutes a "wicked problem", noted Operation Smile’s co-founder and CEO Dr. William Magee as he spoke at the 2018 CUGH Global Surgery Satellite Session - that is, they are complex problems that cut across sectors, disciplines, and borders. This phrase was taken up and repeated by other speakers, many of whom noted the daunting scale of the wicked problem - there are 5 billion people around the world who lack access to safe surgery and anaesthesia care. Fortunately, for every wicked problem in global surgery, there are stakeholders already collaborating across sectors to build and enact solutions to match, and there are students leaders within the next generation that are equally committed to pushing forward for progress. At the Global Surgery Satellite Session, these representatives were given a chance to convene and discuss the challenges they are facing, the solutions they have worked to implement and the results that they have seen. The satellite session featured interactive panel discussions, presentations, and break-out sessions (review the full program here). The program included six thematic sessions on topics ranging from from the surgical ecosystem, global surgery in the regional context, multi-disciplinary approaches to program development, transitioning from trauma and disaster response to sustainable surgical care, national surgical planning, gaps in global surgical engagement, and the role of technology, innovation, and research in global surgery. Diverse, expert panelists and featured speakers shared the insights from their own research and experience. Hon. Dr. Keith Martin (CUGH) welcomed participants and emphasized the importance of surgery to strengthen healthcare worldwide. Dr. Catherine deVries (University of Utah Center for Global Surgery), and Dr. Mamta Swaroop (Northwestern, AAS), also welcomed participants and emphasized the importance of equitable surgery to strengthen healthcare worldwide. 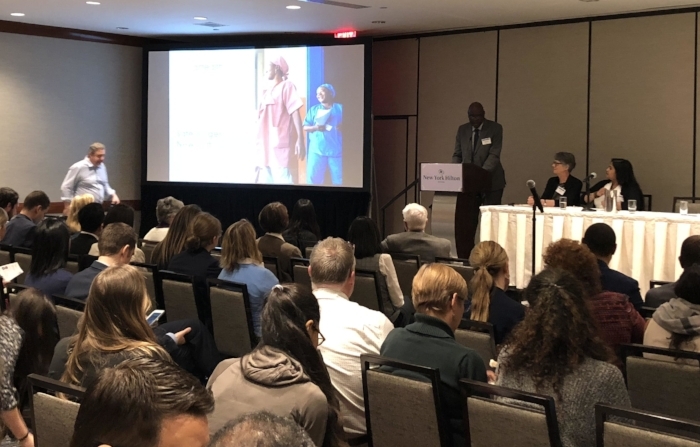 Mr. Pape Gaye (IntraHealth International) gave a featured presentation on the current landscape of global surgery in 2018, while Dr. Ray Price (University of Utah Center for Global Surgery), Dr. Swaroop, Dr. Miliard Derbew (COSECSA), and Dr. deVries participated in a panel that explored global surgery in the regional context. Dr. John Sampson (Johns Hopkins University School of Medicine Representative) and Dr. James Cobey presented a case study on multidisciplinary approaches to global health program development. Dr. Sherry Wren and Dr. Adil Haider (Brigham and Women's Hospital) moderated a panel on gaps in the engagement of the global surgical community, joined by representatives from InCiSioN, a dynamic advocacy group of medical students dedicated to global surgery. Finally, with all panels and break-out groups concluded, the global surgery satellite session ended with a call to action from Dr. deVries and Dr. Mamta Swaroop - a call to action that urged participants to not let the lessons of CUGH to remain within event halls and panel discussions, but to integrate them into action for global surgery and neglected surgical patients. Partnerships, collaborations, and networks will drive the progress that is necessary to achieve safe, affordable surgical and anaesthesia care for 80% of the world by 2030. The key, however, will be the action that we take within those collaborations. We must grow our coalitions, coordinate our vision, and act in concert to effect change on the global scale. G4 Alliance members and many additional stakeholders are already doing so and have achieved incredible progress. Events like CUGH give global surgery stakeholders a chance to reflect and renew, to take the experience and partnership of others and put them into action on the ground to save lives - and to one day solve the wicked problem of global surgery.